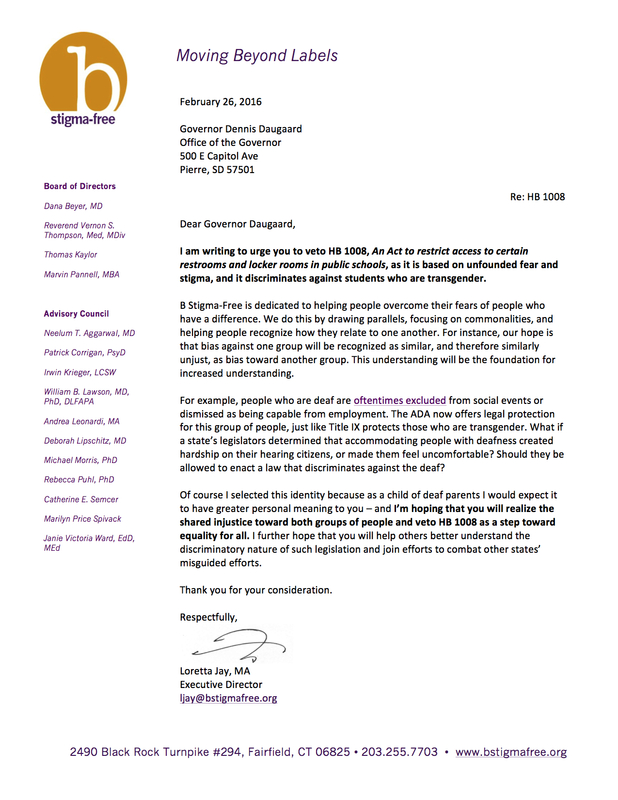 B Stigma-Free called upon South Dakota’s Governor Dennis Daugaard to veto South Dakota’s Act to restrict access to certain restrooms and locker rooms in public schools (HB 1008) as it is based on unfounded fear and stigma, and it discriminates against students who are transgender. The Governor must either veto or sign the legislation by March 1, 2016 or else it automatically becomes law. The South Dakota legislature passed the Bill on February 16, 2016 in a 20-15 vote. If signed by the Governor, it will require transgender students to use restrooms of the gender that they were assigned at birth – not the gender that they identify with. The Bill also requires public schools to provide alternative restrooms if this is requested by the students. B Stigma-Free finds this to be contrary to federal protection provided under Title IX, promotes isolation and separation, and is discriminatory. Update: On March 1, 2016 Governor Daugaard vetoed the legislation!